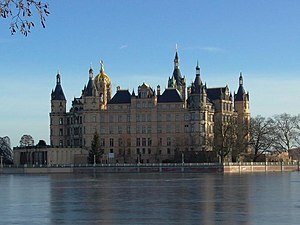 While over on Maria Thermann’s blog I’m discussing the beauty of northern German Castle Schwerin, the erstwhile residence of the Dukes of Mecklenburg, here at Willow the Vampire’s blog I want to tell you a little bit about the Little Man Peter or, as he’s called in German, the Petermännchen ghost that haunts Castle Schwerin. Visitors to Schwerin Castle, a setting as fairy-tale as it gets and seemingly jumping straight out of a Brothers Grimm or Hans Christian Andersen story, will find a depiction of the little ghost in form of a small statue that perches on the façade of the castle. Reputedly still haunting the vaults and cellars of the castle, the little ghost was allegedly a goblin which worked as a blacksmith in one of the many tunnels that connected the castle with nearby Petersberg, a local hill close to the town of Pinnow. According to varying legends, the Little Man Peter can fly through the air and appear anywhere between Petersberg in Pinnow and Lake Schwerin, where the castle sits on an island near the centre of the lake. The goblin played tricks and pranks on people of ill repute. Equipped with a lantern, a sword and a large set of keys, the Petermännchen is actually supposed to be a kindly creature of the night, which deals with thieves and intruders in its own magical way. While dishonest people are plagued with nightly pranks, good and honest people are said to receive their just rewards. Soldiers, who fell asleep while on duty guarding the castle, found a good friend in the little goblin, as the little chap used to wake them up just in time before their dereliction of duty could be discovered by their superiors. Thieves would be driven from the castle. One legend has it that General Wallenstein, in charge of Emperor Ferdinand II.’s troops during the 30-year war in 1628, thought twice about staying for a second night at Schwerin Castle, after the Petermännchen had played so many tricks on him during the first. Sadly, in reality Wallenstein did stay in Schwerin for more than one night, in fact, he made Schwerin his preferred residence, while Mecklenburg remained under occupation. 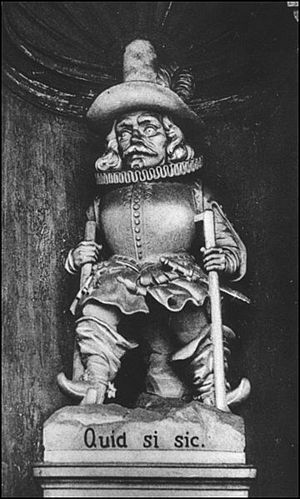 The description isn’t accredited to any particular historic sources so many well originate in the over-heated imagination of the local town council, but it suggests that far from a common-or-garden variety of blacksmiths dealing with ducal stallions and soldiers’ mounts, the Petermännchen worked with precious metals down in the dark tunnels in true goblin and fairy-tale-dwarf tradition. No living human being is able to carry the heavy keys hanging from Little Man Peter’s belt, only he is strong enough. Perhaps he supplied the wealth to the Dukes of Mecklenburg as long as they treated their peasants fairly and stopped digging for precious stones, when Wallenstein’s men arrived? Some local legends claim he is the legitimate heir to the kingdom of Mecklenburg, others say he is cursed because when alive, he killed a priest and now he must exist as a diminutive ghost until he is freed from the curse. Old people in Pinnow claim they could hear the hammering of pickaxes deep down in the Petersberg, when they pressed their ears to the soil and listened. It’s interesting to note that in all the depictions – there are a number of paintings – he is shown in the dress of a cavalier, a “horseman”, a heroic figure rather than a figure of ridicule. It suggests that he may have been a real historic figure rather than a supernatural one. Was he one of the duke’s little people, a person of small statue but with the wit of a giant living inside? 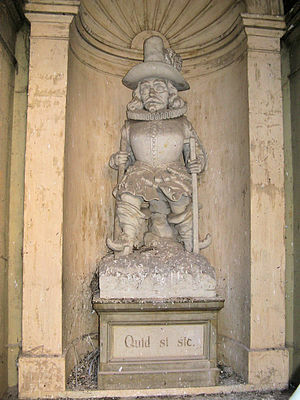 The statue seen today adorning the façade also shows the Petermännchen in 17th century cavalier’s clothes; however, the statue itself dates back to the 19th century. When reading up on the history of the little ghost, I kept wishing that he gave a thoroughly deserved haunting with all the poltergeist trimmings to any visiting politicians during the nasty German Democratic Republic regime, which lasted from 1949 until December 1989, when I visited Schwerin for the very first time just a few days after the fall of the Berlin Wall (officially it ceased to exist in 1990). As a firm believer in “we reap what we sow”, I’m hoping the Petermännchen will haunt any former Stasi people (East Germany’s notorious secret police) to its heart’s content, whenever they are foolish enough to visit the Mecklenburg-Vorpommern State Museum that dwells under the domed roof of Castle Schwerin today. Petermännchen, please give ‘em a good kicking with your wee red boots and your wee silver spurs! They worked hand-in-glove with the governmental thieves that robbed all of us of so much world heritage and brought misery to millions of people for so many years. I would love a little Peter of my own. I could send him to play tricks on people who not very nice. 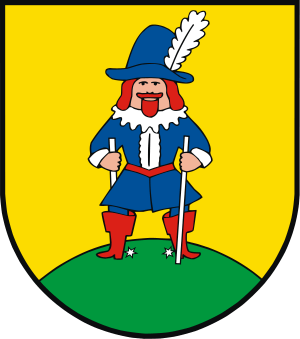 I would sent little Petermaennchen gladly to our local library and give the horrible man what for who keeps following me around, whenever I use one of the PCs there. Honestly, at my age having to duck and dive from some perv. Oh it can be so off putting – take a can of flea spray with you and hold it as if you are about to de-louse him – if that doesn’t put him off, you’ve got problems. Refreshing the mind with walks helps. Which way to the BBC’s new studios? And sometimes writers dig deep to find the inner hero. If all else fails, there’s always cake! A writer’s home is her castle. Brisbane web designers, amazing websites are just the beginning. Make your dream website a reality! Welcome to Stinkforth-upon-Avon! Have a nice bite!